Organising your wedding can be a daunting but exciting task. 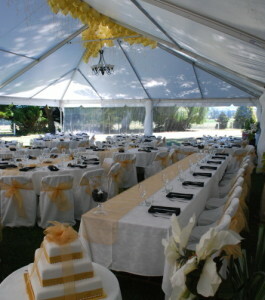 Let Wanaka Marquee and Party Hire help you. We have a huge depth of knowledge about weddings, having been involved in hundreds of weddings over the years and we can take the stress out of your planning. Whether it is crockery, cutlery, chairs, chair covers, lights or even a hot water urn the list may seem endless but we have it all, and if we don’t have it in stock we will find it for you. We have the expertise and experience with wedding hire, come to the Wanaka wedding hire experts! If you want a marquee wedding we can organise this. We have a range of marquees for hire as well as all the accessories needed to make it a beautiful space for your wedding day.